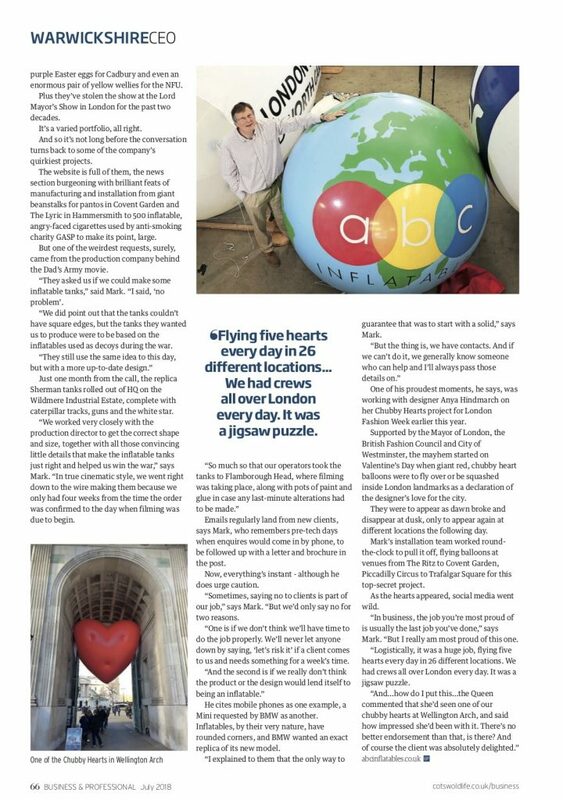 In June 2018, we did an interview with Cotswold Life Magazine for a special edition of their Business and Professional Life supplement. 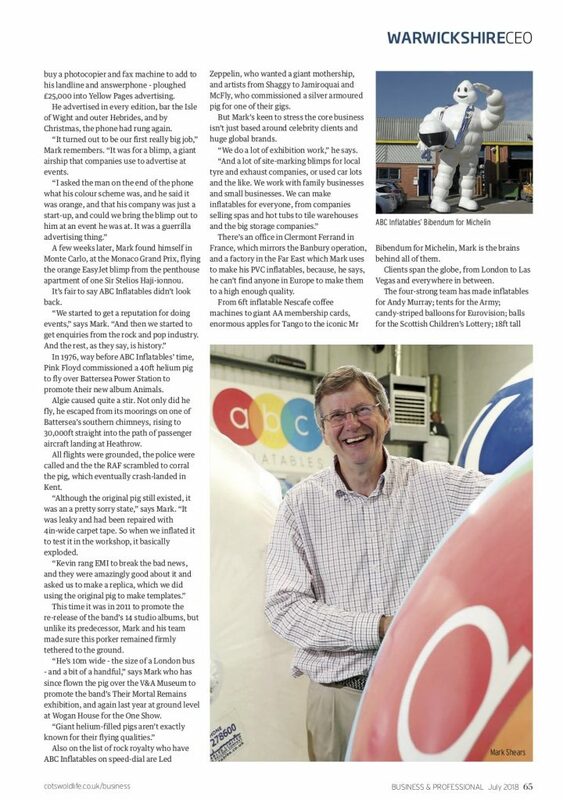 Mark Shears, one of our directors spoke to journalist Tanya Gledhill about ABC Inflatables, our history and some of fantastic commissions we have undertaken over the years. From rock and pop royalty to fashion designers, the TV and film industry and international airlines, ABC Inflatables boasts some of the best-known clients in the world. 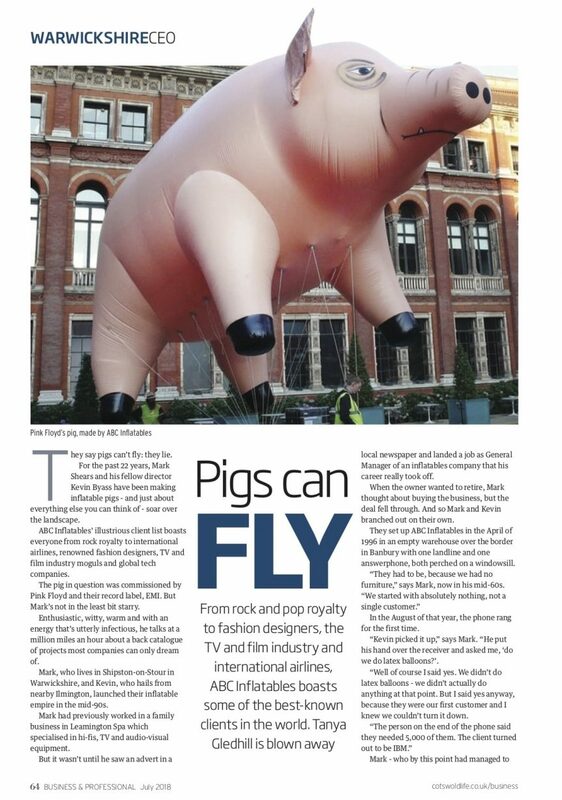 “They say pigs can’t fly: they lie. For the past 22 years, Mark Shears and his fellow director Kevin Byass have been making inflatable pigs – and just about everything else you can think of – soar over the landscape. ABC Inflatables’ illustrious client list boasts everyone from rock royalty to international airlines, renowned fashion designers, TV and film industry moguls and global tech companies. The pig in question was commissioned by Pink Floyd and their record label, EMI. But Mark’s not in the least bit starry. Enthusiastic, witty, warm and with an energy that’s utterly infectious, he talks at a million miles an hour about a back catalogue of projects most companies can only dream of. Mark, who lives in Shipston-on-Stour in Warwickshire, and Kevin, who hails from nearby Ilmington, launched their inflatable empire in the mid-90’s. Mark had previously worked in a family business in Leamington Spa which specialised in hi-fis, TV and audio equipment. But it wasn’t until he saw an advert in a local newspapering landed a job as General Manager of an inflatable company that his career really took off. When the owner wanted to retire, Mark thought about buying the business, but the deal fell through. And so Mark and Kevin branched out on their own. You can read the rest of the article online HERE or below.